April 13, At least 16 people were killed and 20 others injured by stray bullets at protests and sit-ins on Thursday and Friday, a Sudanese police spokesman said in a statement on Saturday as the nation waited to hear from its newly appointed leader. The release of the death toll comes hours after the Sudanese military replaced the country’s transitional leader who had been in power only one day. Sudan‘s military council has pledged to hold talks with all political groups in the country on forming a civilian government, saying it has no “ambitions to hold the reins of power” following President Omar al-Bashir‘s removal. 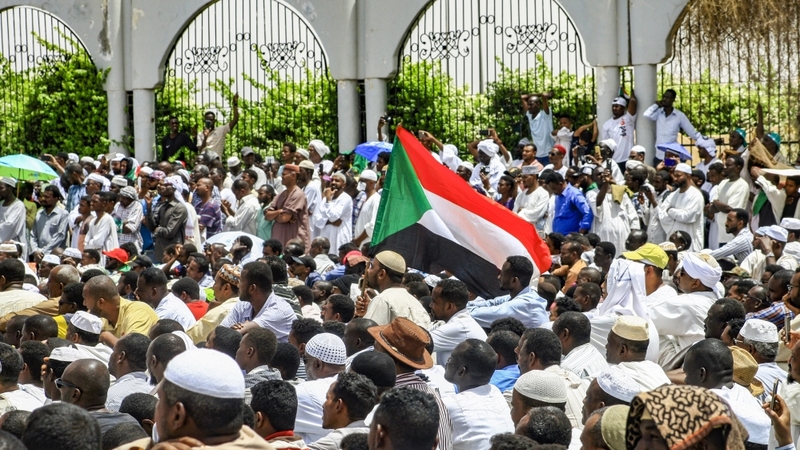 The proposal on Friday was immediately rejected by the Sudanese Professional’s Association (SPA), which spearheaded the months-long protests that triggered al-Bashir’s overthrow by the armed forces the previous day. Instead, the SPA restated its demand for power to be handed immediately to “a transitional civilian government”. Omar Zain al-Abideen, a member of the transitional military council, which is now running Sudan under General Awad Ibn Auf, said the body was “ready to step down as early as a month if a government is formed”. Speaking in Sudan’s capital, Khartoum, al-Abideen said the solutions to Sudan’s crisis should come from the protesters. “We will not dictate anything to the people. We want to create an atmosphere to manage a peaceful dialogue,” al-Abideen said, whilst also warning protesters that “chaos will not be tolerated”. Al-Bashir’s National Congress Party was not invited to join the dialogue, the council said, because “it is responsible for what happened”. The state news agency SUNA said Ibn Auf planned to meet political factions and leaders of the protest movement later on Friday and that he was holding off with announcing the full makeup of the military council pending the consultations. The SPA, however, dismissed the council’s assuarances, saying the body was “not capable of creating change”. “We are still in the path of true revolution,” the group said, pledging to also “resist” the three-month state of emergency and nighttime curfew imposed by the military on Thursday. Al Jazeera’s Hiba Morgan, reporting from Khartoum, said thousands of Sudanese protesters were continuing to join the crowds camped outside the army headquarters in the capital. Thousands had defied the curfew imposed from 10pm to 4am overnight on Friday to maintain their days-long sit-in outside the sprawling complex. “Their (the protesters) whole point is that they don’t want anybody from the old regime or the former ruling party to be a part of the transitional council,” said Morgan. The paramilitary Rapid Support Forces also rejected the military takeover, Morgan said, citing an announcement by the group, which said the military council’s move “falls short of what the people have been demanding for the past four months”. The paramilitary forces said they would not take part in the council, she added. At the army headquarters, the mood among the crowds was festive. Some protesters brought in mattresses, fans and even air conditioners, while others swept the streets to keep them clean, signalling they intend to stay long-term. Separately, the military council announced that it would not extradite al-Bashir to face charges of genocide at the International Criminal Court in The Hague. In the Darfur conflict in the 2000s, up to 300,000 people were killed and 2.7 million driven from their homes by militias backed by al-Bashir’s government. “We may try him, but we will not hand him over”, said al-Abideen. To do so would be “an ugly mark on Sudan … even rebels carrying weapons, we don’t extradite them”. Notably, Ibn Auf, a veteran establishment insider was himself under sanctions by the United States for his alleged role in supporting those militias. Ibn Auf said on Thursday that al-Bashir was being detained in a “safe place”. Sudanese sources told Reuters News Agency that the longtime ruler was at the presidential residence under “heavy guard”. Ibn Auf had also announced a state of emergency, a nationwide ceasefire and the suspension of the constitution. World powers, including the US and Britain, said they supported a peaceful and democratic transition sooner than two years. China said it would continue to seek cooperation with Sudan regardless of the political situation. Antonio Guterres, UN chief, called for a transition that would meet the “democratic aspirations” of the Sudanese people and appealed for “calm and utmost restraint by all”.